My name is Asa Pingree and I build furniture. Sometimes I introduce myself as a furniture designer, but it’s a fine line that I am still exploring. I grew up working with my hands and seeing the object as the focus of the work as opposed to the design. So I appreciate the craft that I practice, but I also look forward to seeing my designs become more accessible in the future, which sometimes requires not having my hand on everything. At some point if I don’t have my hand on everything I may see myself more as a designer and less as a craftsman. I had a couple of workshops in New York that were focused on fiberglass and carbon fiber. Growing up building boats, working with fiberglass for the most part, I was mainly focused on high-tech composites and building things lighter and stronger and longer-lasting. So in my New York shops I mainly built a downhill racing skateboard out of carbon fiber and it was an engineering challenge that fit my expertise very well. That was a business that I ran for quite a few years and enjoyed thoroughly, but the real beauty of the experience happened in the early days, in the design and the engineering process. After that point it became just an object to be reproduced. I knew that moving forward I needed work that was more creatively stimulating and allowed me more freedom on a regular basis to explore objects. 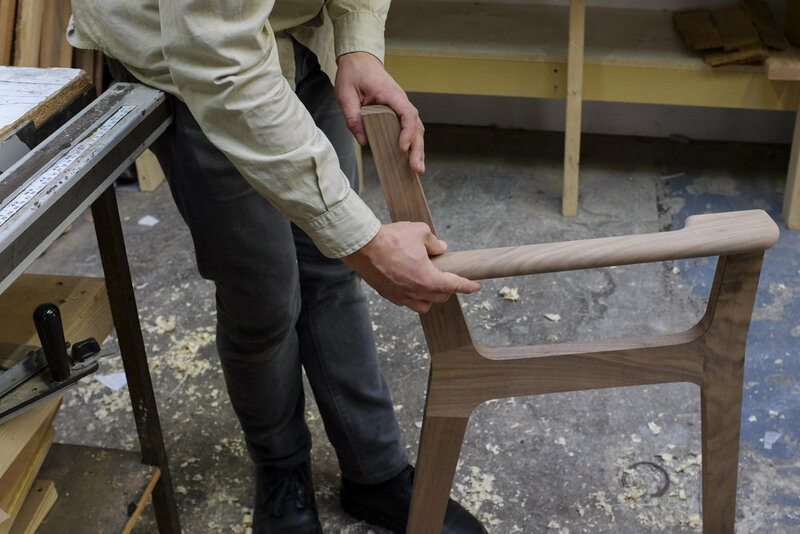 So furniture, when it finally became my focus, felt like something that I had been wanting to do my whole life and hadn’t really given myself the right to do. It is the most natural fit, especially in that I’ve spent so much time thinking about the human body and how it utilizes the objects around us. I was an actor growing up, and have also spent quite a lot of time in dance and quite a lot of time in yoga. So the ergonomics of the things in my life have been really important to me. Although I hate the word ergonomic; it hints at there being a right way to have something suit your body. 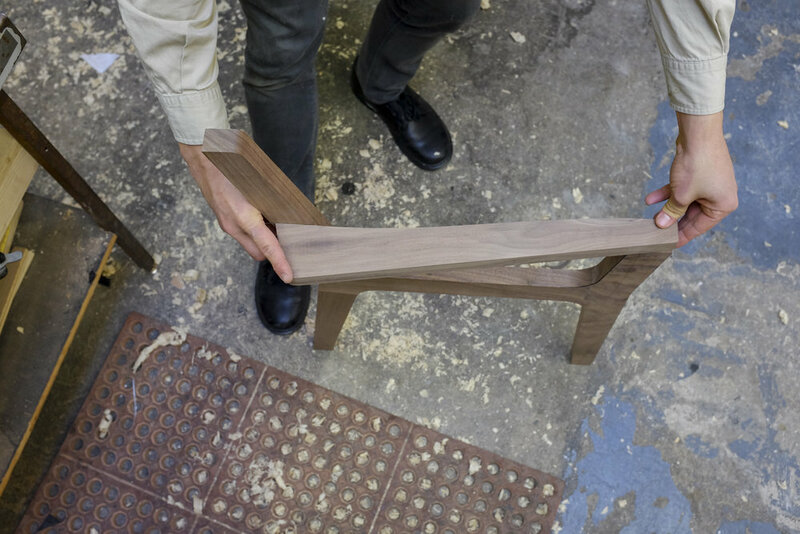 In reality, the really infuriating part about building a chair that works is that when you ask somebody to sit in it, you see people sit down in an infinitely complex way every time. There is no right fit, but finding a better fit and a fit that works for somebody is a goal that I find worth working towards. Four years ago I teamed up with Jason Kachadourian who’s an artist, designer and art event organizer, and we built the coworking space adjoining our workshop. The coworking space is mainly artists in studios and office spaces, and it houses about eighteen to twenty-four people on average. It has really created a community that has been far more beneficial than it has been work for us to manage, and it has been really crucial to us finding our way through starting our own businesses and fleshing out our own design and art. It is all about having this support network of people who are like-minded, independent creatives who are all in the same boat and putting the long days. Well it’s funny, when you work in a woodshop there’s a lot of noise, so you often have on hearing protection and a respirator. My ear protection usually has bluetooth music in it and puts me in a little bubble that can be very conducive to disappearing into the work and focusing and really setting a tone for what I’m working on. At the same time, what I’m working on is often fraught with frustration if it’s a design project, or it requires a lot of focus if it’s a technical aspect of a project. Woodworkers use a lot of math, so the music that I listen to can’t be too distracting. I’m a little embarrassed sometimes about how often I listen to the same albums over and over again. And in another context I think that I would be infuriated by those albums by now, but when you need music that is not distracting and allows for the kind of focus you need for very consistent and laborious work or creative work or contemplative work, familiar music is a really useful tool. When I have employees in the shop, I still go back into that bubble but I’ll get pulled out every few minutes to make sure that everybody is on task and has something to do. That’s really where I work best, in a balance between the ability to focus and also having a team that is keeping me from wandering too far into a tangent. I also occasionally have to get on the computer during the day, and that is a tough extra disruption when you’re managing production. So partnering with Stephanie Smith, who has been my business partner from the get-go, was about having somebody who was going to be more concerned with the nuts and bolts of the new company and the day-to-day operations that are not on the shop floor. That was really a balance that I knew I needed. 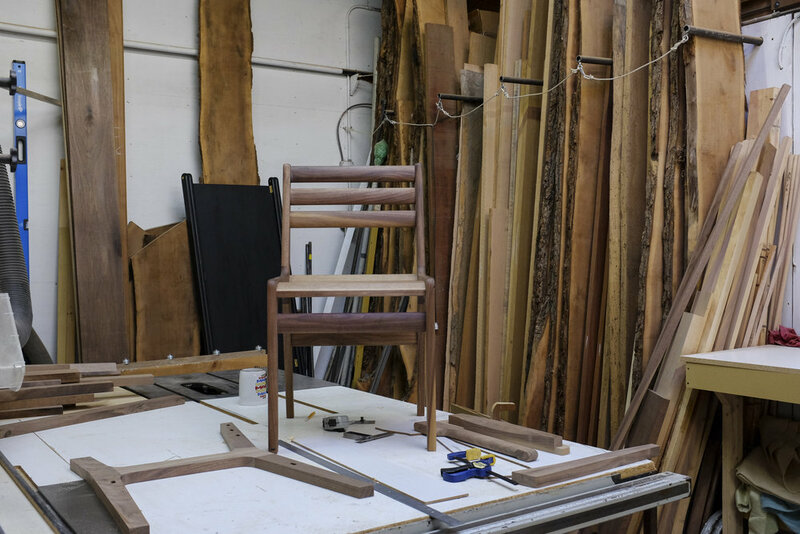 Although it sounds like I start with the human body and build the chair around it, it’s moreso that I start with considering the function of the wood as a structural object and thinking in a constructive way about how to get the most out of the natural strength of the wood. From there I work towards something that I enjoy looking at and touching. I often design dozens and dozens of versions of something before I start building it, but I do find that through many iterations it is often the simplest one that I gravitate towards. As a builder I look at the piece from the get-go in terms of how I will build it, how I will join the wood together, how I will shape it, how I will sand it, how I will finish it, and sometimes how I will package it. Thinking about process, product, and delivery makes me sound like a manufacturer, but it’s more so about the idea that we need to find efficiency in our practice. Otherwise we’re not going to be able to keep doing it and keep teaching other people to do it, all the while sustaining a certain level of quality. But beyond the basics of how I look at the work, my process happens in three very different ways. Sometimes I sit down on my computer and I draw digitally using CAD programs, then move directly to printing a pattern and 3D cutting objects into the patterns. I also occasionally work in a very organic way where I start with a piece of wood and I attach another piece of wood to it. And other times I build a mock up that is something I can sit on but can’t bear to look at. I then take away material until I’ve got what I need. Each of those processes work well, and which one I choose has to do with how much of a conundrum the function of the piece is. The most challenging part is definitely translating life as a designer and an artisan and a maker to being somebody focused on growing a business. 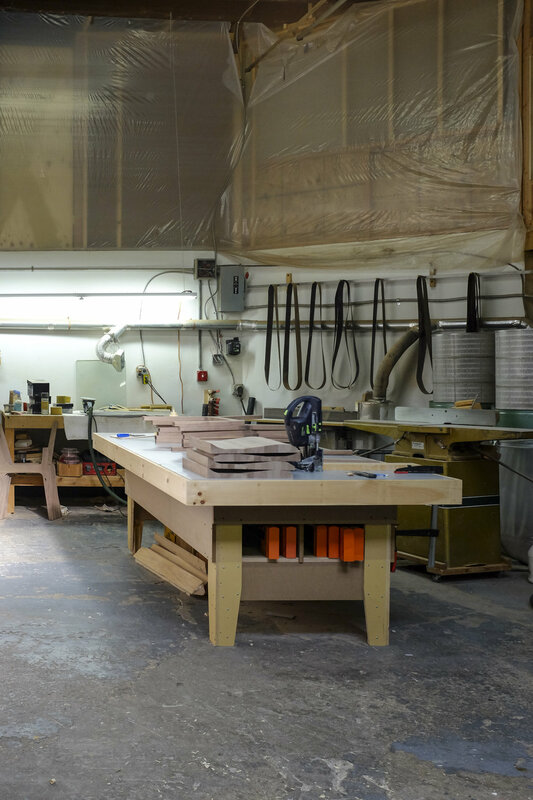 My desire to grow the business and have more options available to me, in terms of the materials I work with and expanding the range of objects and tools that I use, pushes me to build a team that allows me the space and time to do so. It would allow me to fill the role that I’m best at filling, which means not always being in total creative control. It’s often more about being a problem solver and an idea machine, which I am really comfortable with being, and not always the editor. So to have a bigger team and acknowledge my role within that team is crucial to success, while at the same time my strength is also that focused, solitary, creative time. Part of me occasionally thinks that if I only build one chair at a time for the rest of my life, that would probably be a good fit as well. So the question is how much reach you’re looking for and how much you’re willing to juggle, because growing comes with enormous costs and no team is going to take away the weight and struggle of growing a business. It’s a question of what growth is worth it and what’s worth leaving where it is. Ease. Well I would say that the ease for me is the completion of the details of an object and the mechanical process of having my hands on a tool and taking something to completion. I find that to be almost automatic. Part of growing up with boats means that your real expertise is sanding, so to make things perfect and fun to touch is second nature. At what point do you decide that a design is complete? I think that the subjective issue of whether something is “right” or “good” is so tough. The reality is that a piece changes every time you make it. Every time I make a new pattern there’s a slight evolution. The nice thing about having your own business is that when you want to make a big jump in a new direction, you just make something new. In creating this collection I haven’t treated myself like an artist who might show a group of work at a gallery and then the next time produce a whole new group of work. Rather, I’d like to keep producing this chair for the rest of my life. But with an expertise in fiberglass and carbon fiber, my brain designs in those materials all the time. They have the real potential, on an engineering level, for freeing me up in terms of how the materials can behave functionally or structurally. So I’m not too concerned with jumping around; I think that I’m more concerned with building a company that allows me to do what I want, rather than trying to be overly cohesive about what I become known for in particular. With furniture I very intentionally started with wood, because it’s a wonderful material to work with and because oftentimes carbon fiber, which I had worked with previously, is overkill. You don’t need a chair that weighs three pounds, it would blow over. It was also nice to get away from materials that I had to constantly protect myself from. Wood is a natural material. It is something that I’m still protecting myself from the particles of, but I am less concerned with it just sitting on my skin. In terms of types of wood, I have tried to make my choices more about overall design and less about wood as an end in itself. I’ve kept my wood options pretty limited. The nice thing about working only with American hardwood is that it’s largely coming from the northeast, so there’s not a lot of travel time. Also, we are working with trees that often came off of somebody’s front lawn. We’re not clearcutting forests in the northeast to find a good white oak tree. I am not necessarily looking to fawn over the most complicated wood grain or the most ornate fine woodworking type of furniture. So for now I really just work with walnut, white oak, and ash. The ash is usually grey, the oak is usually black, and the walnut is actually the trickiest because we’re constantly trying to find just the right tone that feels not to plastic-y but not too warm. It would be nice to source directly from mills and control the drying process myself, but that requires a lot of space and time that I don’t have living in New York. In what ways have geographic locations and spatial conditions impacted your designs? This is my fourth and largest shop in New York. My first shop was a tent I built in my McKibbin Street loft in Bushwick fourteen years ago. Having more space certainly changes my willingness to build dining room tables and have things that aren’t necessarily bought and paid for but are rather purchased or built on spec, because furniture takes up a lot of your room very quickly, not to mention time and energy. But more interestingly I think my relationship with living space has evolved in terms of my thinking about what we need to fit into a New York apartment. As much as I occasionally go on a design tangent about an object that I would love to have, the focus on essentials comes back over and over again. It is really important to me to build something that has a future life. Ultimately we want to create objects that people love. After a certain number years of living a transient New York lifestyle it’s more likely than not that you’ve moved many times and that the apartments have gotten bigger and smaller, so the objects that we hypothetically can really hold onto have to really mean something to us. An object that we pass onto future generations needs to not only be something that is built to last and has a quality that can last for generations, but also has to be loved in such a way that we want to pass it along. So that’s part of where the feel and function start to come in as well. The aesthetics of something that you’ve really lived with for a long time eventually fade a little and it is the appreciation of the object’s functionality that becomes second nature in our relationship with it. That is where it is important to make things that not only look good but also work well. Does your work tell any stories? My first collection, which isn’t the be-all-end-all of my design interests, was an attempt to create a cohesive balance between making something beautiful and making something that wasn’t desperate for attention. There’s a simplicity, I hope, that could translate to something that is almost ready to disappear and become functional, which is something that a lot of mid-century designers were concerned with. It’s this sort of egalitarian approach to who should have an object that functions well and is meant for living, not just focused on the aesthetics of presentation. My dad is a brilliant furniture maker, but he wasn’t making furniture when I was a kid. He was just building boats, and the boats were really becoming production boats at that time. We would get parts from a larger fiberglass production facility and we would put together a twenty two foot boat in just a matter of weeks. 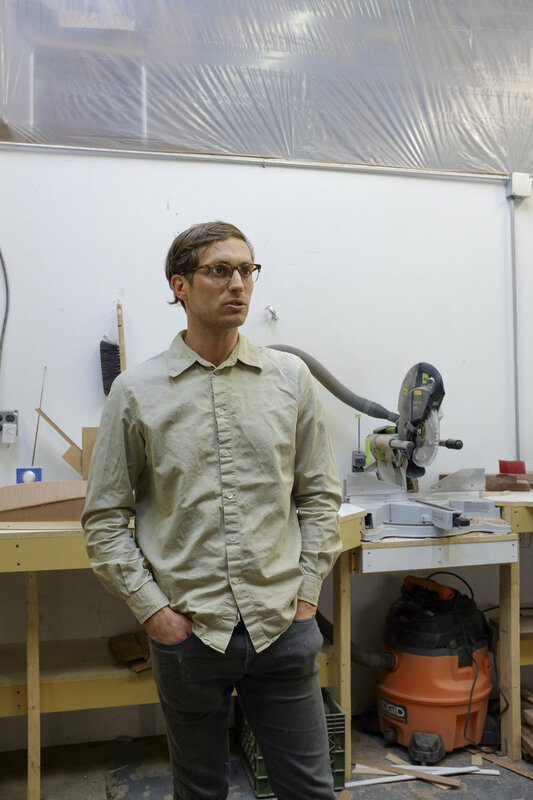 It was a minimal amount of woodwork, but it was the problem solving and the relationship with tools that relates exactly to what I do in my current work. Problem solving is really crucial to being successful in this type of craft because you’re just reinventing the wheel all day every day. Sometimes I’ll even look at a piece that I’ve made many times and think, what’s next? It’s not actually about knowing the next step or following the recipe, rather, it’s about asking yourself what makes the most sense logically. It's a lot to explore the world of design and selling products. It's really great to have such a vibrant and interesting community of like-minded designers in New York who are also trying to find their way, because there’s no magic recipe. It’s so clear that it is actually a combination of many moving parts. Finding the recipe or combination that works for you is easier said than done. We haven't found it here; we’re not even trying to pretend that we have enough information yet to make the big decision of where we’re going in the future because the market is still responding to our brand, our message and the objects. It’s great to have some sales, but a few sales are not enough to tell what the larger appeal or positioning should be. Will we focus on licensing relationships in the future or will we be in galleries and focus on one-offs? Will we become a manufacturer or will we outsource and try to focus on branding and sales operation? I think that understanding and knowing where you want to go is really important to every design choice that you make. The design is always part and parcel with where you’re trying to take it. I’ve thought a lot about the impetus of why I do what I do and about where that impetus wants to go in the future. I’m not sure that I would like to just be in a gallery building beautiful pieces that only a handful of people will ever own. I would like to build something that is more accessible - maybe that is part of being from a small town. There’s something about having a ubiquitous design that I think will be a real goal for me. But I also acknowledge that with small-scale production you have to be focused on sustaining the business. At this point that means not being able to provide anything that is as affordable as I would like it to be. In the future I hope that we have a range of prices, and that the prices have been simplified to a point where we can provide quality woodworking without the work being entirely exclusive. I draw a lot of inspiration from the place that I’m from, the place that I feel most at home and the place that I found myself as a person growing up. I’m from a really small town on a little island off the coast of Maine, with a year-round community of 350 people who are largely lobster fisherman and home-builders. There’s a summer population that quadruples the year-round population, which enables a few businesses to thrive in the two warm months. There’s a great level of craftsmanship and an independence there. There’s a focus on making something that’s personal and of quality and that’s representative of you as a builder. It’s a tradition that I absolutely take forward in terms of feeling like every piece that I make represents me. But at the same time I feel like part of the inspiration is the community itself. The love and support that you get growing up in a place that small is so integral and almost invisible; you know everybody and you get an automatic reflection of yourself every time someone looks at you. It’s this sense of security in who you are that makes me feel like I need to do something with the privilege of coming from a happy, healthy upbringing. I feel inspired to share a positive attitude and a social, civic responsibility that my family has really taken to the nth degree. They’ve made me very proud and they’ve also made me feel like what I do has to be true to myself, even if I don’t save the world it has to represent an intention that it’s crucial to do what makes me happy. Well this morning somebody sent me a poem in an email - One Train May Hide Another by Kenneth Koch. It was an idea that I’ve talked about with this friend many times and it’s a very long poem that continues on this same idea. It really just pounds home the idea that one train, or one object, might hide another and that we need to watch out for the object that we are focused on hiding another object behind it is of greater concern. And it’s not necessarily always of concern; it’s of passion, of human relation, of distraction. It’s the idea that we take a moment and let the train go by to make sure that there isn’t another train coming. At the same time we need to make sure that the drive, the passion and the impetus behind what we’re doing isn’t misdirected because it’s so crucial to know that what you’re doing is inherently what makes you happy. I’ve found this through a few different career u-turns. We have many reasons to persevere in terms of success, money, power and accolades. But if your work itself is something that makes you want to do it, then all of those things take care of themselves. I find that with design, sometimes the making of something new needs to be balanced with persevering in something that is more consistent. Sometimes the rollercoaster is not just about the high where you lose yourself. Sometimes when you’re very invested in your creation the highs are very high and it’s almost too much; the emotional rollercoaster of trying to see something to fruition can often overinvest you. Well the process of designing and making something has felt very much the same. Since I was a kid I’ve been taking what was already there, putting the pieces together and watching the magic happen. I can’t say that has changed much for me recently. What I’ve really learned in recent collaborations is how I fit into a team. That has taught me so much about myself. It has allowed me to feel more comfortable with my inability to make decisions in certain areas and my skills in other areas. You find a way of working with other people and collaborating and sharing responsibility and playing your part. That’s where I think I’ve learned the most about myself as a creative. I don’t think that I could do it without wanting to work with people and wanting to share the experience. My own work is very solitary and I’m glad that I take on other endeavors above and beyond my furniture work; I make sure that I’m exploring that because it’s really where I’ve learned a lot more than I have in my attempt to run a business. It’s definitely an obsession to watch the process change your hands and your body. There’s a certain beauty when you watch yourself create a shape with sandpaper that you’re not conscious of making, but it happens to turn out exactly the way it should. It’s that lack of control, that automatic operation, that has more to do with the brain’s connection to the hand than with the hand itself. That’s really the fun part. It allows you to switch from thinking how do I do this? to thinking what am I doing? As I go on I think less about how I hold things or where I’m putting pressure and I focus on the object itself. Then things take care of themselves. In terms of my actual physical hand, occasionally I’m in a round of sanding and things start to get beat up and swollen, so I jump back on the computer for a day or two. I don’t think that I’ll ever have the mits that my father has, and to some degree it kind of makes me sad to know that as things get busier I will probably spend more time on a computer. At that point I’ll have to find a balance so that I don’t lose the connection the I have with my hands now. It’s that connection that makes them a tooI enjoy working with. Asa Pingree in Brooklyn, New York on February 24, 2017. Photographs by Julia Girardoni.